Monsters, Inked is a new comic from the creators of The Greys. The latest strip can be found in print version of The Bucks Herald each week – but if you’re not local to the Aylesbury area of the UK we’ll be posting them here two weeks later. Like our other comic, The Greys, these strips are released under a Creative Commons Attribution Non-commercial Share-alike license. That means you’re allowed – and, in fact, positively encouraged – to download them, share them with your friends and even modify them. The only restrictions are that you can’t use them for commercial purposes (but do get in touch with us if you’re interested in commercial use), and any modifications you release into the wild have to be under a similar license. Because The Greys are drawn entirely on a computer using the Open Source Inkscape program, we make our source files available for download so that others might learn from them. 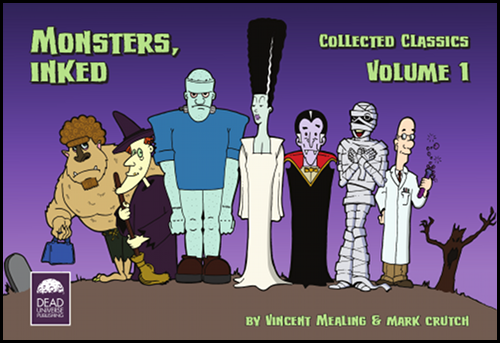 Monsters, Inked, on the other hand, starts life as a hand drawn strip, so we’ve decided not to provide any source files. You can, of course, save the final image files from this site for your own use, and if you really do need a higher resolution version then get in touch and we’ll try to help. 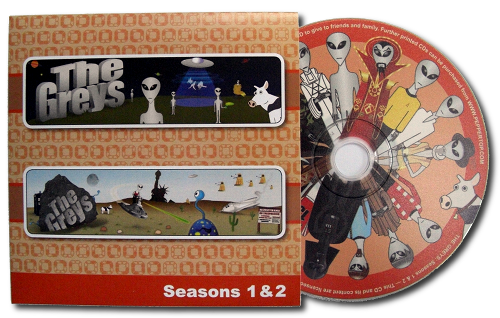 We put one or more Easter Eggs in each Greys comic – usually by hiding them in the source files. With no source files to download, Monsters, Inked won’t include any Easter Eggs. We also won’t be naming each strip, and will only occasionally add any commentary or description to go with them. In short the two strips serve very different purposes: The Greys is a webcomic that occasionally appears in print, whilst Monsters, Inked is a print comic that we happen to be posting online. 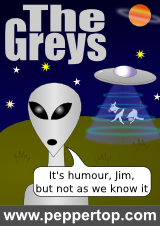 So once you’ve read the latest adventures of our monsters, whether here or in the Bucks Herald, why not take a look at The Greys, read some commentaries, download some source files or go hunting for Easter Eggs. Oh, and don’t forget to go and meet the monsters. This strip first appeared in The Bucks Herald on 2nd November, 2011. As a Bucks Herald reader I’m already on comic 3 which is so far my favourite and the funniest. Looking forward to reading them each week.